My first recommendation would be for PSV to buy McKalla Place from the City of Austin. Buy it now, and start construction on a temporary stadium there immediately. In 2014, the City valued the property at McKalla Place as between $5.5 million to $7 million, (source). TCAD now has it closer to $8.7 million, (source). Let’s just call it $10 million. Whatever. Buy it now. Either buy it for the asking price or maybe the City makes it easier. There are a lot of things the City could do, (that it already does all the time), to encourage PSV to take the land through incentives and rebates. For example, when the Domain development was proposed, the City gave $5.7 million in rebates to the Simon Property Group under an incentive agreement, (source). Over the past decade, the City of Austin has paid more than $43.7 million in incentives to a handful of private companies, (source). A long lease could work too. Or even a license agreement. 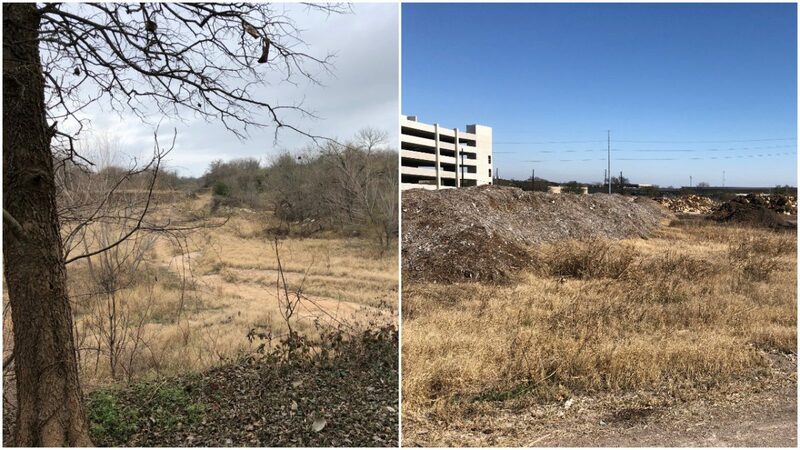 Just last month, the City voted to give dedicated public parkland to Austin Pet’s Alive, (a private entity), for a term of 25 years and two (2) additional 25-year options for a total of 75 years, (source). This was done through a license to avoid the need for a public vote. I don’t remember any protests. The point is, this can happen quickly and it can happen easily. Buy the land, lease the land, license it. Just do it now. Toyota Field in San Antonio is a great wee stadium. It was designed and built by a San Antonio architecture group that specializes in the development of professional sports venues. The group reported that the San Antonio project came with design challenges that included “a tight budget, unique site topography, a very small site footprint, and a short construction timeline”, (source). Despite those challenges, the finished stadium, which is estimated to have cost roughly $35 million, was completed in just over a year, (source). It holds 8,000 fans and was designed to be expanded up to 18,500. Assuming there are no more chemical surprises, there is no reason that a similar stadium couldn’t be finished at McKalla Place in time for the start of the 2019 MLS season. Once McKalla is acquired, and a temporary home is secured, then PSV can announce the move to Austin, and get everything approved by MLS. They may have to deal with some legal issues in Ohio, but as I already explained, I don’t think there is anything there that could prevent a move. The owners can start working on moving the front office, building a new team, working on a new name, new colors, and building a fanbase. The sooner this happens the better. I’ve not forgotten about Guerrero Park. It’s in a great area and would conform with all of the urban core stipulations. A stadium would take up 5-10% of the current park. It’s big enough to accommodate a stadium and still be a public park of the future. However, absent a license agreement, the lease of public parkland to a private entity will require a public vote. So let’s put it to a vote in November 2018. There will be opposition, but with McKalla already secured, the team will know that they are coming regardless of the outcome, and I think there is a good chance that they still get that small percentage of the park to develop. If PSV win, great. Now Austin’s new MLS team can play at McKalla Place and take their time to design and build something amazing at Guerrero Park. Then when it is time to move to Guerrero, in maybe four or five years, PSV could sell the land back to the City, or sublease it, or keep it. The McKalla location would make a great training facility, or a youth academy, or simply as a community soccer destination. If PSV lose, fine. Go and play at McKalla for two years. Build a winning team. Build a fanbase. Sell it out every weekend to 8,000 season ticket holders. Prove to the City that the team needs and deserves a bigger home. Show the people of Austin the benefits of a soccer team in the community. Then in November 2020, put Guerrero Park to the vote again. This time instead of 60 protestors at Guerrero Park, you’ll have 8,000+ soccer fans demanding that the City make a new stadium a reality. PSV would no longer be framed as greedy, Silicon Valley, out-of-state opportunists, looking to steal away public land from the people of Austin. Instead it would be a local sports team, with owners that have proven their commitment to Austin, and that have already invested millions into the City. If PSV win that vote in 2020, great. They can play at McKalla while the Guerrero stadium is built. If PSV lose again, then they could just build up on McKalla. Increase it to 18,000-20,000 and enjoy playing on your own property. That’s it. That’s my solution as to how PSV can make professional soccer in Austin a reality by taking control of the situation, and taking it out of the hands of the City. One last note as to why the economics of this might work. Because that’s always the bottom line. Presumably PSV will have budgeted for the cost of borrowing a field for several seasons while a permanent home is built. The UT Myers stadium is the option that most people seem to suggest as a temporary home. But that will not come cheaply. Based on my experience, I would estimate that UT would want upwards of $10 million a year for PSV to use Myers. That would be UT’s demand a) because it would be a major inconvenience for UT, and b) because UT can ask for whatever they want. To put that in perspective. Even if PSV got Guerrero Park in a vote it would still need to pay $10 million every year to UT while it builds a stadium. Or it could make a one-off $10 million payment to the City of Austin for property that could accommodate their own temporary stadium, and then get most of it back in rebates. The only problem I see with my solution is that for this to work it needs to happen now. PSV needs time to announce the move and deal with that fall out in Columbus. It needs time to build the temporary stadium. It needs time to build the case for a permanent home at Guerrero Park. And most importantly, it needs time to build anticipation and excitement for professional soccer in Austin. All great ideas however PSV has said they want free land or the economics don’t work to move. That does not mean it can’t happen but their goal is first free land and if not that maybe these options come into play. After listening to the comments at the crew season ticket holder event it does not sound like they have a lot of money but who actually knows at this point.